"Wear this one!" Nikki put a dress in my face. I laughed, "Why can&apos;t I just wear normal clothes?" "You&apos;ve got to look good for the guys," Nikki winked before pulling out another, "This one." I sighed, "Alright, how about I&apos;ll wear this one," I pulled out one that went just above my knees. It was light purple with wrinkles. Nikki nodded, "Deal," she handed it to me. I changed into it. Nikki helped me tighten it, "Is Brie coming tonight?" Nikki sighed, "She flew over to your parents." "Without Daniel?" I asked as Nikki handed me some light brown high heels. I put them on. "Yeah," Nikki grinned lightly, "I think she feels bad." I nodded, "Well that&apos;s good." Someone knocked at the door and Nikki answered, "Hey, girl!" Cameron walked in along with Naomi, Natalya and Eva. "You look cute," Eva walked over with a smile on her face, "Who are you trying to impress?" she raised her eyebrows. "I think we all know," Nikki said. The girls laughed. "I don&apos;t understand," I tried acting casual. "You will be midnight," Nikki patted my arm. "Come on, let&apos;s go, it&apos;s almost eleven already," Nattie stood up. "Ok, we&apos;re coming," Nikki put her high heels on before leading the way out. We arrived at the place. I got out of the van and walked in first. Superstars and Divas were everywhere. "Gabby, lets go get a drink," Nikki grabbed my arm and led me over. You can&apos;t make me get drunk, I thought as I got a martini. "Is John coming?" I asked as I took a sip. "He should be here," Nikki looked around, then smiled, "I&apos;ll be back." Nikki disappeared into the crowd. I couldn&apos;t see her as she approached a hidden Dean. Dean turned around, "Oh, hey Nikki." "Gabby is looking for you, she&apos;s trying to find someone to dance with." Dean smirked, "Where is she?" Nikki giggled, "You like her, don&apos;t you?" Deans smile disappeared. He didn&apos;t say anything. "I knew it! Now we just have to convince Gabby," Nikki looked over at me when my back was turned, "Go ask her to dance." Dean nodded, "Alright," he walked towards me. 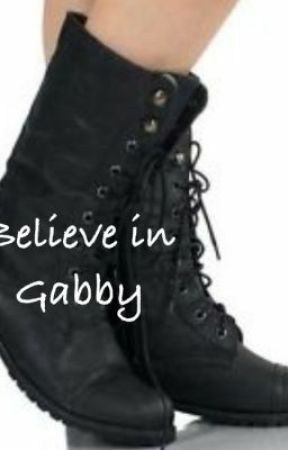 "Gabby," I heard a voice behind me. I recognized the raspy voice. I turned around to see Dean. "Hey!" I smiled at him. Holding myself back from doing anything. "You want to dance?" Dean held his hand out. "Are you sure that&apos;s a good idea?" I whispered. "Nikki told me to come ask you. Shes trying to hook us up, can we just tell everyone?" "Not yet, I need time to think it out," I said. Dean sighed, "Fine, then we need to play the act tonight. Dance with me."